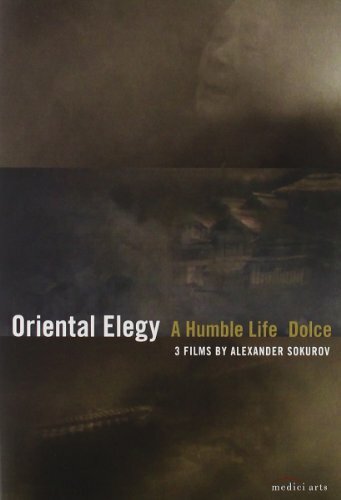 Oriental Elegy is the first among the 'Japanese' videos by Alexander Sokurov, where real people are represented in their normal conditions and surroundings. They are simple people, but not ordinary. Their originality lies in the specificity of their souls, where poetry and mythology mean more than the symbols of contemporary reality. A Humble Life: The whole work is an unhurried and detailed report from an old solitary house, lost in the mountains, in the village of Aska (Nara Prefecture), Japan, where an old woman, Umeno Matshueshi, lives alone. Sokurov's camera creates a poetical image out of trivial details, out of the refined simplicity of Japanese life. Dolce: A well-known Japanese writer, Toshio Shimao, who died in 1986, his widow and their daughter. The documentary form serves as a framework to underline this film's deep insight into the biographical narration. There is but one way to touch that world, to feel its exquisite flavour and its perverse pain, - to do it as in a lyrical music piece, tenderly, dolce.